In haemolytic uraemic syndrome (HUS), the small blood vessels inside the kidneys are damaged. There are changes in the blood and the kidneys stop working as well as they should. There are different types of HUS – the most common is called STEC-HUS (or VTEC-HUS). STEC-HUS happens in a few children after a tummy infection caused by bacteria (germs) called E. coli. The tummy infection causes diarrhoea, feeling sick or being sick, and sometimes blood in the stool (poo). The small number of children who get STEC-HUS after this infection usually get very ill, and need to be admitted to hospital for monitoring and treatment. They may feel weak and tired, look pale and/or get tiny pink or purple spots on their skin. They may not pass urine (wee) as much as normal, and may have swelling in their body. STEC-HUS can lead to other complications that will need treatment. Most children fully recover from this STEC-HUS, and it does not come back. Some children will have long-term problems with their kidneys, and in serious cases will need long-term specialist care. sometimes, blood in the stool (poo), which may start a few days after children first get diarrhoea – if your child has blood in his or her stool, take him or her to your family doctor. Infections can spread very easily. Your doctor may ask you to take your child out of school or nursery to avoid passing it on to other children. The kidneys do not work as well as normal in this disease. This may lead to acute kidney injury (AKI) – when the kidneys suddenly fail or stop working properly – and some of these children need special treatment. STEC-HUS may also lead to high blood pressure (hypertension), which may cause headaches, vomiting or blurred (fuzzy) vision. seizures (convulsions or fits), problems with vision, or paralysis (when part of the body cannot move) – this is called cerebral HUS and is very rare. The tummy infection is caused by germs (bacteria) called Escherichia coli, or E. coli. Both children and adults can become infected by E. coli by being in contact with the faeces (poo) of animals that carry E. coli. The infection can also spread from person to person. There are many strains, or types, of E. coli – one type that is more dangerous, and may lead to HUS, is called E. coli O157. Most people get better after a tummy infection. However, a few people who are infected by STEC develop STEC-HUS. This kind of HUS used to be called D+ HUS (the D stands for diarrhoea) or ‘typical’ HUS. The most common source of STEC in the UK is cattle, though the bacteria have also been found in faeces of other animals, including deer, rabbits, horses, pigs and wild birds. swimming or playing in contaminated water, such as ponds or streams. Your child’s doctor will talk to you or your child about his or her symptoms and any medicines that he or she takes, and do an examination. Your doctor can diagnose (identify) STEC-HUS after some tests, such as a urine test, blood test and stool test. If your doctor thinks that your child has a STEC infection – even if he or she does not develop HUS – your clinic or hospital will inform your local health protection unit. A public health officer may speak with you to find out how your child might have been infected. This will help prevent the infection from spreading. Your child will probably need to stay in hospital for a few days or a few weeks. A team of healthcare professionals will monitor your child to check how well his or her kidneys are working, test how much he or she is urinating (weeing), and measure his or her blood pressure. They will support you and your family throughout the treatment. Any child admitted to hospital with diarrhoea will be cared for in isolation (without other patients around). This reduces the risk of passing on the infection to other people. Many children with STEC-HUS will not need special treatment, but will be carefully monitored to make sure they have the right amounts of water, salts and minerals in their body. Some children need to make temporary changes to what they eat and drink, and may need a feeding device to make sure they get the nutrients they need. Some children will need treatment for complications. This may include medicines, a blood transfusion or, more rarely, surgery. The kidneys do not work as well as normal during this illness. In some children, this is more serious and they will need dialysis, which uses special equipment to remove waste products and extra water and salts from their body. wash fruit and vegetables before cooking or eating. Family members who might have been infected by STEC also need to take care to avoid passing on the infection. If they work in food preparation, health care or child care, they will need to stay off work. If your child has HUS, it is important to wash your hands very carefully, especially after changing or touching nappies or soiled clothes. This will help prevent the infection from spreading to other members of the family. Many children with STEC-HUS get better after a few weeks. Some children will have more serious complications that need treatment. There is a small risk of death. Reports indicate that 2 or 4 children in 100 with STEC-HUS die. This usually happens shortly after they first develop the disease, often because of gastrointestinal complications (in the gut). All children who have STEC-HUS need to go back to the hospital or clinic for follow-up appointments, sometimes for years after the illness. These check for any health problems, including with their kidneys. About 3 in 10 children will have long-term problems with their kidneys. These children may need further care. They will need to go back to the hospital or clinic for regular follow-up appointments. Occasionally, STEC-HUS can lead to long-term problems in other parts of the body, including the gut or the central nervous system (including the brain). STEC-HUS happens in a few children after they have gastroenteritis, an infection in the tummy (or gut) that is caused by shiga-toxin-producing E. coli (STEC). sometimes, blood in the stool (poo), which may start a few days after children first get diarrhoea. If your child has blood in his or her stool, take him or her to your family doctor. occasionally, tiny pink or purple spots on their skin – caused by a drop in the amount of platelets, blood cells that help the body to heal (thrombocytopenia). Some children have complications, more serious health problems. Your child’s healthcare team will carefully check for complications. They will talk about the treatment options with you. The kidneys do not work as well as normal in this disease – we say there is reduced kidney function. feeling breathless – this happens when fluid builds up in the area around their lungs. A small number of children with HUS get high levels of sugar in their blood. This happens when the pancreas, which makes and releases chemicals that break down food, becomes inflamed – this is called pancreatitis. This may cause burning pain in the tummy and back, nausea and vomiting. The pancreas makes the hormone insulin, which controls the level of sugar in the blood. If it is inflamed, it cannot make enough insulin, and this may lead to acute diabetes, when the body has too much sugar. Children will need to be given insulin by injection. It is usually temporary, but children need follow-up. The E. coli infection that causes STEC-HUS affects the colon (large intestine, or part of the bowel). Some children get colitis – when the colon becomes inflamed and irritated. Children may get tummy pain or cramps, may have stomach pain and may feel tired. Some children cannot eat normally – they may need to get nutrition into their blood using a plastic tube in a vein. Occasionally, surgery is needed. very occasionally, paralysis – when part of the body is unable to move. STEC-HUS happens in a few children after they get gastroenteritis, an infection in their tummy or gut. This infection is usually caused by a particular germ, a bacterium called Escherichia coli O157, which is often shortened to E. coli O157. Most children recover from gastroenteritis caused by these bacteria. In a few children, the infection causes HUS. E coli is a type of bacterium that is often found in the guts of animals, including cattle, sheep, deer and goats, and sometimes pets and birds. E. coli does not make the animal ill. However, some strains, or types, can cause illness in humans. People may be infected with E coli O157 by eating food that has been contaminated with the bacteria (usually because it has been contaminated with the animal’s faeces, or poo). The most common strain of E. coli that may cause HUS is E. coli O157. Shiga toxin damages the lining of blood vessels in the body. This usually happens in the intestines (gut), causing a tummy upset, including diarrhoea and sometimes blood in the stool (poo). In some cases, it can affect the kidneys, causing HUS. Each year, between 800 and 1000 cases of STEC infection are reported by doctors in England. Compared to other bacteria, such as Salmonella or Campylobacter, which also cause tummy bugs, STEC infection is rare. However, doctors take STEC infections very seriously because the disease can be fatal (cause death), particularly in infants, young children and the elderly. The highest numbers of cases are seen in children aged under 9 years of age and the number of cases is slightly higher in females across most age groups. For every 100 children who get a STEC infection, about 10 will develop HUS. Often, we see STEC-HUS after an outbreak, which means that a large number of people get infected with E. coli. Only a small number of STEC are needed to cause illness. This means that the infection can spread quickly and easily within the family and in other settings such as nurseries, primary schools, nursing homes and hospitals. In HUS, there is damage in the small blood vessels of the kidneys. When the body tries to repair the damage, this causes problems with some blood cells, the living parts of blood. Platelets move to the areas that have been damaged, and clump together. They partly or completely block the blood vessels. This also means that there are fewer platelets going around the bloodstream. Red blood cells, which carry oxygen round the body, try to pass through the blocked blood vessels. They are broken up into little pieces. The cells that line the small blood vessels in the kidney filters (glomeruli) are damaged. The body tries to repair this by bringing in blood cells called platelets. Platelets form clots, or clump together, at places where there is damage. These clots partly or completely block the flow of blood. The platelets are used up trying to repair damage in the small blood vessels. This leads to a lower level of platelets in the rest of the blood, which is called thrombocytopenia. This can cause tiny pink spots on the skin and easy bruising. Red blood cells are broken up into little pieces as they pass through the narrowed blood vessels. This causes haemolytic anaemia. Because red blood cells carry oxygen round the body (in a substance called haemoglobin), a reduction in the number of these cells can cause children to feel weak and tired and look pale. The kidneys stop working as well as they should. Children may urinate (wee) less or not at all. Water, salt and waste build up in the body. Inside the kidneys there are about one million nephrons. 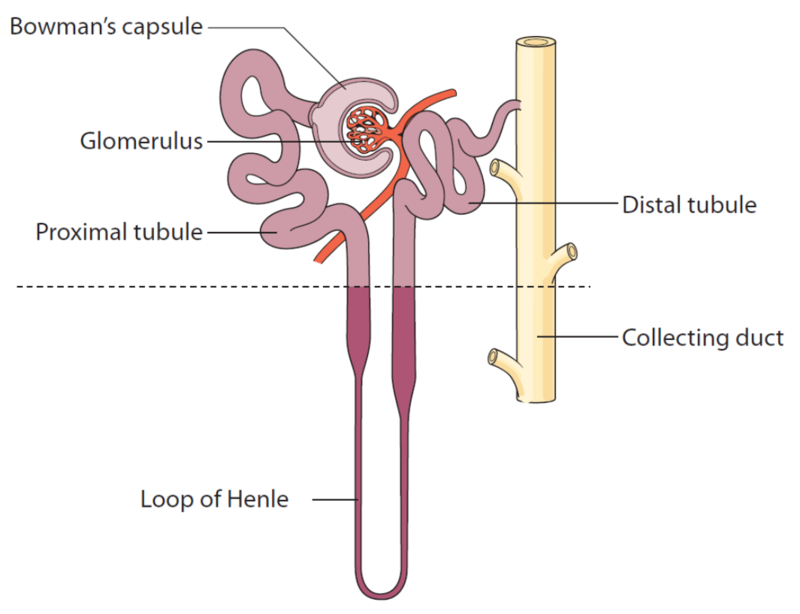 Each nephron is made up of a glomerulus (when we talk about more than one glomerulus, we say glomeruli) and a renal tubule. Most of the water, and some other substances in the blood, pass through the glomeruli. The blood clumps together and forms clots in the glomeruli. The glomeruli cannot filter blood as well as usual. The kidneys makes less or no urine, and water, salt and waste build up in the body, leading to swelling.The word uraemic means a build-up of waste in the body. HUS may also happen after chest infections or meningitis (a disease in the area around the brain and spinal cord) caused by pneumococcal bacteria. This causes pneumococcal HUS. In serious cases, this can lead to complications with the brain. Most children with pneumococcal HUS will need to stay in hospital for monitoring and treatment. They will need to take antibiotics, medicines that kill the bacteria. As the infection is treated, the HUS should go away. Other bacteria and some viruses can also sometimes lead to HUS. HUS can occasionally be caused by some medicines, or linked to other diseases. Atypical HUS is a rare type of HUS that is not caused by an infection, but rather is thought to be linked to genes. It may run in families. Some children with atypical HUS have diarrhoea, but this is not usually related to a STEC infection. This type of HUS tends to keep coming back, and is more likely to lead to long-term problems with the kidneys. Your child will need some tests to diagnose (or identify) STEC-HUS and find out the best treatment. Your child will need an examination, blood test, urine test and stool test. Your doctor will examine your child, and talk to you or your child about the symptoms and any medicines that your child takes. Your child’s blood pressure will be measured, using a special instrument. This is because HUS may cause high blood pressure, or hypertension. the amounts of important chemicals in your child’s blood. A full blood count measures the numbers of different types of blood cells. Children with HUS normally have a low number of platelets, blood cells that form clots to help the body heal. They may also have a low amount of haemoglobin, the substance on red blood cells that carries oxygen round the body. In a blood film, a thin layer of blood is examined under a microscope. In HUS, this may show broken red blood cells (these are called fragments). A blood test can check if there are any antibodies, proteins that are made by the immune system to find and kill specific germs. This gives information about whether there has been an infection caused by E. coli, or STEC. Urea and creatinine are chemicals that are made in the body. They are waste products and normally removed by the kidneys into urine. In severe cases of HUS, these may build up and there are higher amounts of these in the blood than usual. The blood test can also find out how well the kidneys are working (kidney function), by measuring the amount of creatinine in the blood. This can be used to estimate the glomerular filtration rate (GFR), which is the amount of fluid (liquid) the kidneys filter each minute. You or a nurse may need to collect some of your child’s urine in a small, clean container for a urine test. A dipstick will be dipped into the urine – this is a strip with chemical pads that change colour depending on what substances are in the urine. The sample may also be sent to a laboratory for more accurate tests. Children with HUS may have blood cells and/or protein in their urine. Your child will need a stool test, which is normally done at the hospital. A nurse will collect a stool (poo) sample from your child. Children with HUS may be found to have STEC in their stool. If your doctor finds that your child has a STEC infection – even if he or she does not develop HUS – your clinic or hospital will inform your local health protection unit. A public health officer may speak with you to find out how your child might have been infected. This will help prevent the infection from spreading. Children with STEC-HUS are usually admitted to hospital, where they are carefully monitored during their illness to make sure they have the right amounts of water, salts and nutrients. Some children need medicines to help treat complications of the disease, such as high blood pressure (hypertension), high blood sugar and anaemia. Some children need a blood transfusion. More rarely, surgery on the tummy is needed. The kidneys do not work as well as normal during this illness. In some children, this is more serious and they need dialysis for some time, which uses special equipment to remove waste and extra water and salts from the body. Your child will probably be admitted to hospital for a few days or a few weeks. He or she will be looked after by a paediatrician, a doctor who treats babies, children and young people. If your child is suspected of having a STEC infection, he or she needs to stay in an isolation cubicle. This is a special area of the hospital that keeps your child away from other patients. This is because STEC can be passed on to others very easily. Your hospital staff will let you know if there is anything you need to do to prevent spreading the infection. 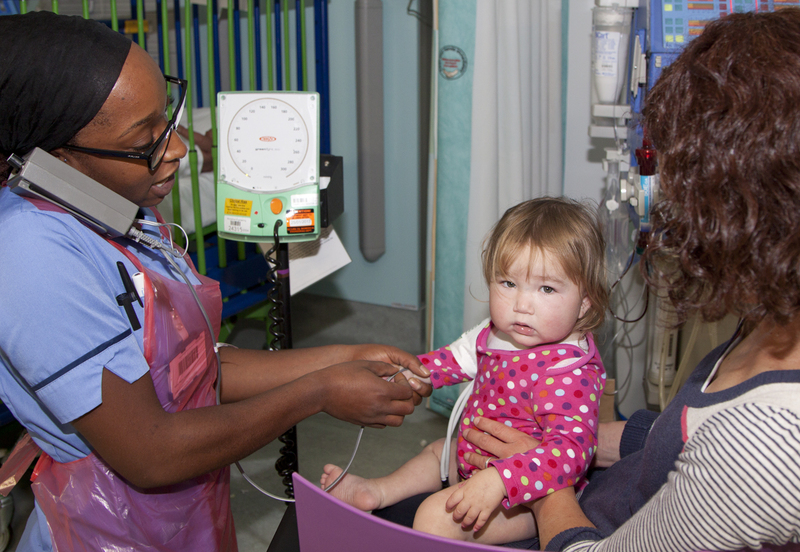 Many children are referred to a paediatric renal unit, a specialised unit for babies, children and young people with kidney conditions, which may be in a different hospital. This is often needed for children with some complications, including hypertension and/or acute kidney injury (when the kidneys stop working as well as they should), and who may need dialysis. Your child’s healthcare team will carefully monitor your child to make sure he or she has the right amounts of water, salts and minerals in his or her blood. Your child may need an intravenous infusion, or a drip, to get fluids into his or her body. Your child’s kidneys may stop making as much urine as normal, or sometimes make none at all. His or her healthcare team will check how much your child is drinking and how much urine he or she is passing, to make sure he or she does not have too much fluid or too little fluid (dehydration). They may also weigh your child. An intravenous infusion, or drip, may be used to get fluids into the body. A doctor or nurse will insert a cannula, a plastic tube, into your child’s vein. This is connected to a bottle or bag containing fluid, which drips through a tube into the vein. Your child’s healthcare team will also check your child’s kidney function (how well his or her kidneys are working). They will test your child’s urine with a dipstick and check his or her blood pressure. Your child will need good nutrition (food) during this illness, and this will be carefully monitored, especially if his or her kidneys are not working properly. It is important that your child has enough calories (energy) and the right amounts of electrolytes, which are minerals such as sodium (salt), potassium, phosphate and calcium. Your child may also need to drink less fluid, such as water, squash and soft drinks. Your doctor, nurse or a renal dietitian will give you more information about your child’s needs. Some children with HUS may feel sick (nausea), be sick (vomit) or have tummy pain, and they may not want to eat very much or anything at all. Your healthcare team can place a tube or an intravenous line to give feeds with calories and electrolytes, as well as water and medicines if needed. Enteral feeding gives feeds directly into the stomach. A nasogastric tube is a long, thin tube that is placed through the nostril, down the throat and into the stomach. It is inserted using special medicines so your child cannot feel pain or is asleep. If your child needs dialysis, the tube may also be placed at the same time as preparing for this treatment. Parenteral feeding gives feeds directly into the bloodstream. A ‘line’ is inserted into one of the large veins in your child’s neck – this is usually done under general anaesthetic so your child can sleep through the procedure. Children with STEC-HUS may have high blood pressure, or hypertension. Their blood pressure will need to be controlled so it is in a healthy range. If your child has hypertension, he or she may need to change what they eat and drink, and may need to take medicines. A small number of children get pancreatitis, when the pancreas, which makes and releases chemicals that break down food, becomes inflamed. This can lead to diabetes, when there is too much sugar in the blood. Some children need to take insulin, a hormone that is normally made by the pancreas, to help control the amount of sugar in their blood. This is given with a needle. This problem usually gets better over time. Children with STEC-HUS get anaemia. The blood has fewer red blood cells or less haemoglobin, a substance that is in red blood cells. Because red blood cells and haemoglobin carry oxygen around the body, children with anaemia often feel weak and tired, and may look paler than usual. In some children, anaemia can be treated with folate (folic acid) medicines that help the body make more haemoglobin. These are usually taken by mouth. Many children have more severe anaemia, and need a blood transfusion to receive healthy blood from a blood donor (another person who has given some of their own blood). A transfusion usually takes a few hours, and blood is given through a plastic tube in a vein. Children who have had a blood transfusion do not need to take folate medicines. The kidneys do not work as well as normal during this illness – we say there is reduced kidney function. Most children develop acute kidney injury (AKI), where the kidneys quickly stop working properly. In some children, the kidneys get better over time. However, about half of children with STEC-HUS need dialysis while their kidneys are not working properly. Dialysis uses special equipment or a machine to ‘clean’ the blood, removing waste products and extra water and salts, and sometimes adding important salts. Most of these children need this treatment for a short time only, but a few need it for longer. There are two types of dialysis. Your child’s healthcare team will give you information so you understand the benefits and risks of each type, and the surgery that is needed to prepare for dialysis. Haemodialysis: your child is connected to a machine, usually for a few hours at a time, which cleans his or her blood. Your child will have a catheter (a long thin tube), or a ‘line’, inserted into one of the large blood veins in his or her neck – special medicines are used so your child does not feel any pain. Blood is pumped out of the body through a tube, into the machine, where it passes through an ‘artificial kidney’ called a dialyser, which is like a filter. The cleaned blood is then returned to the body through another tube. Blood is pumped out of and into the body quickly – only a small amount of blood is outside the body at any time. Peritoneal dialysis: your child’s peritoneum, which is the lining of the abdomen (tummy), is used to clean his or her blood. Your child will have a catheter inserted into his or her peritoneal cavity, which is a space around the organs in the abdomen. A special fluid (called dialysate) is put into the abdomen, where it sits for a few hours or longer, while the peritoneum filters the blood. The waste products, extra water and salts in the blood move into the fluid, and then this is drained out of the body. This can take place overnight, or several times a day. Rarely, STEC-HUS affects the central nervous system, including the spine and brain – this is called cerebral HUS. Plasma exchange (also called plasmapheresis) is sometimes recommended for these children. However, doctors do not yet have enough evidence to know whether this procedure can help children with cerebral HUS. The aim is to remove substances that may be harming the body. Using a special machine, some blood is removed from the body and separated into two parts – blood cells and liquid (plasma). The blood cells are returned to the body, along with the liquid part of blood that may come from a donor or may be made in a laboratory. Plasma is the liquid or watery part of blood. It helps carry blood cells, protein and other substances around the body. Plasma exchange is a procedure that removes blood from the body, separates the plasma and any harmful substances, and returns the blood, with a plasma substitute, to the body. Each plasma exchange takes about 2–3 hours and is done in hospital. Some children will need more than one exchange. A catheter, which is a large tube, is inserted into one of the large veins in the chest or neck. This is usually the same catheter that is used for haemodialysis. Your child’s blood is taken from his or her body through the catheter. Using special equipment, your child’s blood is separated into two parts: the plasma and any harmful substances; and the blood cells. Your child’s blood cells are added to a plasma substitute – either plasma or a protein called albumin from a donor, another person who has donated blood. This is then returned to your child’s body through the catheter. As blood is taken from your child and returned to him or her at the same rate, only a small amount of blood is outside his or her body at any time. The most common source of STEC in the UK is cattle, though the bacteria have also been found in faeces (poo) of other animals, including deer, rabbits, horses, pigs and wild birds. Teach good hygiene – wash hands before eating, after handling raw meat, after using the toilet or changing nappies, and after contact with animals. Supervise children closely to ensure that they wash their hands thoroughly. Do not use gels or wipes instead of washing hands with soap and water. Gels and wipes do not remove E. coli O157. Cook meat products right through, especially minced meat. Use separate chopping boards and kitchen utensils for raw meat and cooked or ready-to-eat foods, to avoid contamination; store raw meat at the bottom of the fridge, to avoid juices dripping onto ready-to-eat foods. Only leave cooked foods, meat and dairy products out at room temperature for a short time. Avoid unpasteurised milk and cheese while your child is growing up. Thoroughly wash all salad vegetables and do not prepare them with utensils that have also been used for raw meat. If you have been ill with STEC, do not prepare food for others for at least 48 hours. If your child has been in contact with animals, hand washing is especially important. Do not swim in water that you think may be contaminated by cattle and sheep in nearby fields. Camping or holiday homes, especially in very rural areas, may have water supplies that are not from the mains (and so can be contaminated by cattle or sheep in nearby fields). Avoid touching faces or putting fingers in mouths while in farm environments. Wash hands thoroughly with soap and water after touching animals, fences or other surfaces in animal areas. Do not eat or drink while touching animals or walking round a farm and only eat and drink in picnic areas or cafes. Remove and clean boots or shoes that might have become soiled, and clean pushchair wheels. Then wash hands thoroughly with soap and water. If your child develops a tummy bug and you think it may have been caused by something he or she ate, you should take your child to your family doctor (GP) to have this confirmed. Certain illnesses, particularly those caused by food, have to be reported officially in case there is an outbreak. Your doctor will need to report this to the local health protection unit. This will help make sure other people – especially young children and the elderly – do not catch the infection. Most children fully recover from STEC-HUS, and do not have long-term problems. It is usually a single episode, and so does not come back again. Children who need dialysis for more than two weeks are more likely to have long-term kidney problems. In a recent UK study 7 out of 389 children with diarrhoea-associated HUS died during the acute illness (when the child first became sick with HUS). They were more likely to die when other parts of their body, such as the brain, were severely affected. The study showed that the survival rates had improved since an earlier study. Your child will need to have follow-up appointments at the hospital. If your child needed dialysis, he or she may need to continue going to these throughout their life. It is important to go to these appointments, even if your child seems well. You will also have the opportunity to ask any questions. At these appointments, your child may have his or her height and weight checked, and a physical examination. Your child will need to have blood pressure measurements – at first, very often, and later about once a year. About a quarter or a third of patients who have had STEC-HUS have high blood pressure (hypertension) and this will need to be controlled. Your child may need blood tests to check for the amount of protein and other substances in his or her blood, and measure his or her kidney function. Your doctor will do urine tests to check whether there is more protein in your child’s urine than usual (proteinuria). If there is proteinuria, this may be a sign that your child’s kidneys are not working as well as they should. Your child may need to take a medicine to try to reduce the amount of protein in his or her urine – the medicine may be an angiotensin-converting enzyme inhibitor (ACE inhibitor) or angiotensin-II receptor blocker (ARB). Children who make a full recovery from HUS can usually do all the things that other children their age do. They should be able to go back to school or nursery, play with other children and stay active. A few children will have long-term problems with their kidneys. Their kidneys stop working as well as they should – this happens slowly, often over many years. This is called chronic kidney disease (CKD). These children will need further, specialist treatment in the future. If your child has CKD, you and your family will learn more over time about how to help manage the condition, and what to expect. cerebral HUS (affecting the central nervous system, including brain) – including seizures (convulsions or fits), problems with vision, or paralysis (when part of the body cannot move). This can be a difficult and stressful experience for your child and the whole family, including other children. If you have any concerns or need additional support, speak with your doctor or nurse. This is the end of the information on STEC-HUS. If you would like to read more about other kidney conditions, tests and diagnosis, treatment or supporting information, you can find a list of topics covered on the infoKID website at www.infoKID.org.uk. Version 1, December 2013. © RCPCH, BAPN and BKPA 2013, all rights reserved. Reviewed by: December 2016.